As we approach Martin Luther King weekend, it seems appropriate that my congregation, Unity Temple Unitarian Universalist Congregation, is exploring what it means to be a Community of Prophecy. We are entering an era when we especially need to tend to the building of trust, the building of community, and the building of connections that both sustain us and call us to stand with those who share our values. I believe in the transformational power of love. The bedrock of my faith is that we as human beings have the capacity to change and grow, and it is love--love within us, love among us, and love beyond us--that calls us forward. I am a minister because I believe that congregational life is where we as human beings may cultivate this transforming love. It is agape love, love of the dignity of human beings that is key. When our lives are aligned with this kind of love, we hold the keys to our dignity and we are the authors of our actions. The tradition of religious prophecy goes back thousands of years to the Jewish Prophets: human beings who came out of a cultural milieu, recognized where injustice and inhumanity was rampant, spoke out vociferously for changing the ways society is run to be more equitable and humane, and lived in and among that cultural milieu. Indeed, all the world religions have begun with a teacher or set of teachers recognizing the need for people to come around a life-giving principle or way of life. At the heart of each of these traditions is the call to compassion, the call to treat other human beings with dignity and respect, the call to tend the most vulnerable and challenge those with power and wealth whose way of life causes suffering. Those who hew to those teachings in times get called prophets. Whether in the days of old or in the 21st century, there are three essential qualities that make a prophet. First, a prophet comes out of a particular culture and grapples with its social norms. Second, social injustice and the resulting suffering and sorrow compels the prophet to distinguish the values that are life-giving and those that are life-denying ; and third, the prophet calls upon all who buy into and reinforce the dehumanizing cultural norms--the status quo--to change their ways so as to alleviate human sorrow and suffering. This month we celebrate the vision and call of Rev. 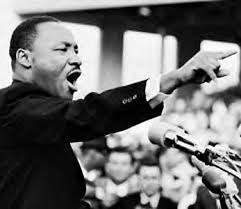 Martin Luther King, Jr. and we also shall witness the inauguration of President Donald Trump whose rhetoric and cabinet nominations suggest he wants to dismantle many of our cherished institutions of democracy. If we are committed to the transformational power of love, we shall grow in our prophetic witness as we explore where love is calling us as individuals, as a congregation, as a wider society. This Sunday I will preach on "A Call for Unity, A Call for Resistance." If you are in the Chicago area, come join us. We are in temporary space during our building's restoration at United Lutheran Church, located at 429 Greenfield St (at Ridgeland) in Oak Park. On Monday, join me and members of 85+ congregations working on racial & economic justice, as we celebrate Martin Luther King Day at St. Mark United Methodist, 8441 S. St. Lawrence Ave., Chicago. We will gather at the 805 South Blvd. office in Oak Park at 7:30 a.m. for breakfast and prayer; buses and carpools depart at 8 a.m. sharp. Bus fee is $10; pay as you are able. May blessings multiply as we cultivate a Community of Prophecy in our congregations and beyond. Avoid the bad habit of domesticating the prophet of your choice, turning him into a cheerleader for your way of thinking and way of life. Remember that all the great prophets were courageous and outrageous folks who railed against the powers-that-be, challenged self-satisfied posit, threatened the prevailing social order, and would find you falling short in some significant ways. Behind the lone prophet who speaks up, there is a group. …it is always a mistake to imagine that lone prophets are really alone. … We should think of Jesus this way as well. It is a mistake to see him as an isolated, heroic individual. It is better to see him as the crest of a wave, the sparkling foam breaking brightly from the force of a whole ocean moving and swelling up from underneath. I sense among Unitarian Universalists these days a deep desire to affirm the ocean that is within and beneath the voices of individual conscience that we celebrate.